Coiling grey spires lift into the sky, stretching until they’re out of sight. An unmistakable smell heralds the coming of important days. The crack, pop, and hiss of prayers, hopes, and memories that everyone in Vietnam knows well, especially around this time of year, just before Tet. As I’m writing this it’s the middle of a lunar month. That means my quiet studio next to a pagoda harbors a faint smell from the street. The same smell isn’t all that uncommon where I’m from either, though typically it’s from campfires and the other scents used to cover the smell of smoking substances of questionable legality. Here though, incense has meaning, and the burning of gifts is a regularly practiced ritual as commonplace as going to a dentist. The purpose of the fires is not for warmth, nor to dispose of papers, nor simply for the lovely scent. It’s to make a connection. Burning “ghost money”, otherwise known as joss money or “tien am phu” in Vietnam specifically, is a tradition that dates back, well, to before Vietnam was Vietnam. The practice goes back to before 200BC in China. Those who know their history might recall that China occupied Vietnam for a few periods, starting in the 2nd century BC. Naturally then, some of China’s culture came to Vietnam and persists to this day. Now it’s something that one could say is decidedly Vietnamese, as the styles and patterns of ghost money in Vietnam differ from those used in China. The purpose, however, is the same: to take care of the family. Death in Vietnam is complicated, both taboo in conversation but still a common part of life. After the passing of a family member, the remaining family members often have a meal on that same day each year. The meal is called “co gio” and is a way of remembering the deceased. On the same day, the family will also typically burn ghost money for the family member existing past the ether outside of moral life. The money, cast in flames, is transformed from something of this world to something of theirs. In this way a family member can care for others residing beyond the grave. Burning “ghost money”, otherwise known as joss money or “tien am phu” in Vietnam specifically, is a tradition that dates back, well, to before Vietnam was Vietnam. The practice goes back to before 200BC in China. Burnt offerings aren’t limited to money, of course, as anyone living in the afterlife needs more than just cash. Paper clothes are easily spotted along with paper-mâché horses. Less common, though still easily available, are small-scale model paper houses and even paper iPhones and cars that can be burned so as to send care packages to family members on the other side. It makes sense physically one might suppose. For some reason people of many faiths seem to think that the afterlife is somewhere up in the sky. Perhaps it’s owing to the infinite mystery the night sky held for humankind for untold years. Perhaps it’s due to the pinpoints of life that hang in that void. We know these lights as stars now, but two thousand years ago people weren’t privy to our modern deeper understanding. And so it seems natural to burn offerings to those departed. The items vanish in a transformative nature, just as humans vanish from this world and transform from a living human to something else. The ashes then rise to the heavens, only to eventually disappear. In a way it connects the living mortals with those who’ve already passed, just as how many feel that family from bygone ages watch over the living. It links the living and the dead. Of course, this tradition of providing money for the dead doesn’t only exist in Asia. Ancient Greeks used to place coins in the mouths of the deceased so that their spirits would have money to bribe Charon, the ferryman of the afterworld, to carry their spirit across the river Styx into the afterlife. Some Eastern European groups would likewise place silver coins upon the eyelids of the deceased to ensure the eyes stay closed lest the dead saw their own death in the eyes of their loved ones. The difference, however, is that Vietnam still actively provides money for the dead as a norm. In doing so, it connects modern-day folk to their past. It provides individuals a moment to reflect on important days of the year on the positive memories they’ve had and send on their prayers and positive thoughts to hope for continued good times. On a broader scale, it also connects people, even unconsciously, with an aspect of national identity - it’s a way in which even the most modern tech-savvy individual is connected in a small way to Vietnam’s history and modern cultural inheritance. The money and all that makes perfectly good sense given tradition, but why the incense? Sure, it smells good and certainly people tout the relaxing and therapeutic effects to the scented sticks, but what are they really and why do people use them? When people hear the word “incense” in Asia they almost certainly think of direct-burning incense, or incense that is lit and then blown out, leaving a small smoldering ember. These incenses come in many different forms, but two of the most common you’ll see are the cored-stick version and the coil version, the latter especially common at pagodas. You’ll find cored stick incense almost everywhere in Vietnam, as every home and even most shops have small alters to provide offerings to spirits where people will place smoldering incense sticks. The sticks typically have bamboo at their core and have been coated in a mixture of aromatic and burning agents. Coil incense on the other hand, as the name implies, is coiled around in a spiral, either flat or longer and extending downwards in a sort of cone shape. The result is an overall larger amount of burning mass in a small space. This means that with a single light and extinguishing, one can have burning incense that lasts a very long time indeed, sometimes up to days. Perhaps you’ve seen similar items in Western countries used on patios to deter mosquitos, though of course those ones are of a different composition, featuring a citronella odor. In Vietnam, incense tends to be odorless or with mild floral scents, as the purpose isn’t the smell but the smoke. Going even further back in time, the purpose was sometimes simply to act as a timer in assorted traditional and medical practices. 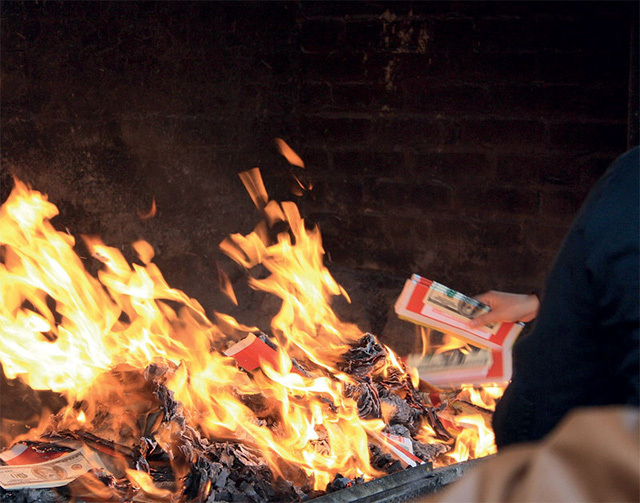 While burning offerings has long been a part of Vietnamese history and tradition, there are those who question the practice, as burning such paper, especially those with ink on them, can release dangerous chemicals into the air. Anyone who has spent much time in Hanoi is aware of what the air is like, and certainly that’s not primarily due to such offerings. Nonetheless, recent research has linked the burning of incense and exposure to its smoke with various forms of respiratory cancer. During your time in Vietnam, though, that probably shouldn’t be of much concern unless you intend to shut yourself in a poorly ventilated room with smoke for weeks on end. When visiting a pagoda, or passing by someone in front of a small metal fireplace, should you notice the smell of smoke you’d perhaps be better off savoring the moment, as you’re experiencing living history, rather than worrying about some research studies. More than that, you have a brief moment where you’re privy to the stream of thoughts, memories, hopes, prayers, and wishes of a complete stranger. Perhaps one might not know the specifics of what joy, sadness, concerns, and aspirations that smoke is carrying, but for me, if just for a brief moment as I wheel my motorbike out of the garage to engage in the art of navigating Hanoi’s traffic, I’m reminded that the nameless, faceless stranger up the street from me is human too, with all the complexities and emotions that that entails. Perhaps that’s a hidden purpose of burning papers and incense in Vietnam - a chance to slow down a moment and remember time spent with loved ones, to take a moment and be grateful for the blessings we have now rather than regretful for the things the media tells us we should long for, and to renew optimism for what the future may hold. Vietnam’s past is littered with some weird and wonderful traditions.